Vertue Box: We Mermaid For Each Other! I was thrilled when I was asked to review the Vitamin Sea edition of Vertue Box, especially after reading the collection would be focused on sustainable packaging as well as utilizing marine extracts known for their health boosting properties. I viewed several of the sneak peeks leading up to dispatch day, and I was fully expecting to become a mermaid princess after using all the potential products hinted at for the April release. If you don't know already, Vertue Box is a bi-monthly subscription service that delivers between five and seven green, clean, and cruelty free beauty products all centered around an original theme. Past editions include Skin Food, Mindful, Good Hair Day, Active, Wanderlust: Asia, and more, and have featured award winning brands such as Tabitha James Kraan, MOA, Isla Apothecary, Madara, and Siskyn, as well as boutique businesses like Luna Kloris, Trepadora, and Alchemy Oils. Every partnership is fully vetted, ensuring each product "is cruelty free, natural, certified organic or wild-crafted, sustainably and ethically sourced, eco-friendly, and charitable." I have been following this beauty box for so long, and have always been impressed by the reveals I have seen. I have to say, the reality is even better. Vertue Box comes in a white cardboard box with minimal ink printing (which as you know is better for the planet! ), and when you open it up, you are met with elegant white tissue with Vertue's axiom "live green, live good" embossed on the paper. The effect sets you up for a luxurious experience from start to finish, and makes the whole box feel that much more personal. I carefully unwrapped the tissue (this will be something I will reuse in the future, so I didn't want to tear it!) 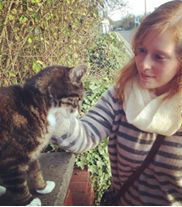 and was greeted by six beauty treats and a hint of a whiff of seaweed. Two items were protected by reused bubble wrap for safe traveling, and I appreciated both the lack of excess packaging and the care with which everything was packed up. While Vertue Box gives helpful hints as to what brands and types of items will be included in each collection, I love that they do not reveal any definites so the surprise element is still there. I knew that I would be seeing Seatox, Pacifica, Hydrea, Earth Harbor Naturals, and The Salt Parlour, but I had no idea which specific products would be appearing. And I have to say, I could not have hoped for better picks! The box includes a bath soak, facial spritz, body exfoliator, facial sponge, eyeshadow palette, and a multi-purpose supplement, which makes for a great range of beauty treats. There is an information card included that lists the name of the products as well as a brief explanation as to what each does. This does not state the value of anything however, nor does it give any detail as to how the items should/could be used, so I did find myself doing a little bit of quick research to make sure I was doing things correctly. 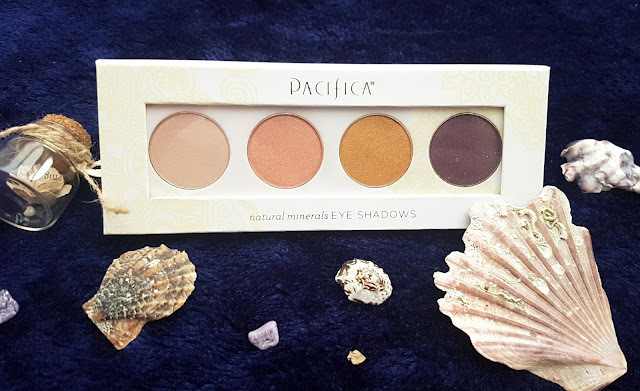 I have used several Pacifica products in the past, such as their holographic nail polish (adore), cleansing wipes (pass - phenoxyethonal), shimmer coconut multiples (love), and the Island Life palette (also love! ), so this is a brand I am very familiar with. Pacifica is totally vegan-friendly, and promises to always be free from phthalates, lead, and other common nasties found in makeup and skincare products. Since I have already tried and tested their eyeshadow formulas before, I knew I would really like this palette before I even swatched the shades. The pigment is fantastic, and the iridescent formula has a shimmer that is not too glittery so it is perfect for brightening up your eyes without being over the top. Plus, the colour lasts all day in my experience, so that is a definite win! The Enlighten Palette has four underwater inspired colours (R-L): Urchin, Golden, Coral Sand, and Skinny Dip. Each is infused with coconut water to soothe and soften the skin, as well as safflower seed oil that acts as an anti-aging emollient. The lighter shades are perfect for my everyday look, but I have to admit I am never quite certain what to do with darker shades. A quick check online let me know that Urchin is ideal for smudging/blending, or if applied wet it works as a bold eyeliner. Ingredients: Mica , Zinc Stearate , Ethylhexyl Stearate(plant Source) , Cocos Nucifera (coconut) Oil , Carthamus Tinctorius(safflower) Seed Oil , Macrocystis, Pyrifera (brown Kelp) Extract , Panax (ginseng) Root Extract . May Contain : Silica, Dimethicone , Calcium Sodium Borosilicate, Tin Oxide, Titanium Dioxide, Ci 7789, Ferric Ferrocyanide Ci77510, Iron Oxides C1 77491, Ci 77742, C177499. My bathroom very quickly started to smell of brine and kelp -- it sounds unpleasant, but trust me, it was actually lovely. It was like bringing the ocean to my home! I let the seaweed rehydrate in the hot water before diving in myself, but after letting it soak for five minutes I took the plunge. The tendrils were a little tickly to start, and while the experience was odd at first, I quickly adjusted. I set an underwater playlist on my Spotify and just embraced my new mermaid life. It is astonishing how much I love this product. If you had told me a week ago that I would be bathing in seaweed I probably would have laughed, but now I am already looking forward to my next session. The bag in the Vitamin Sea Vertue Box is full sized, meaning there is between 70 and 80 grams of sea-salt encrusted dried plant in each pack. 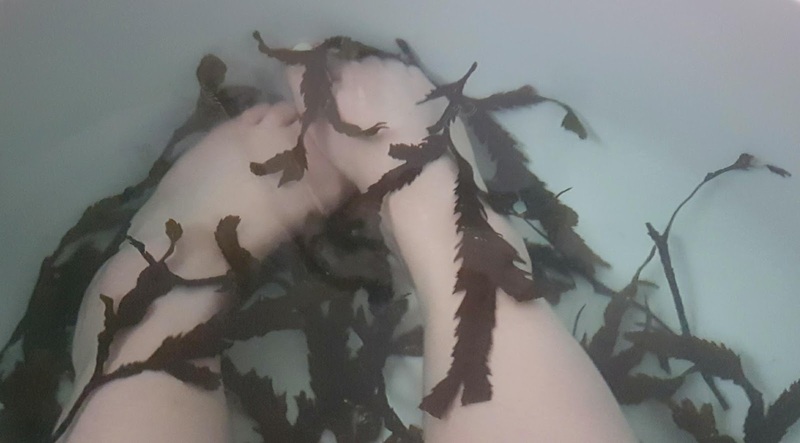 While it did not fill by bath to bursting, it definitely expanded more than I originally expected and made me feel like I was floating in a mini kelp forest. The instructions state that each seaweed parcel can be reused a couple times, and when the gels have gone you can then use this for composting -- such a brilliant, zero-waste product! This is the one product in the box I was not as excited about, only because my experience with powder supplements in the past has been so horrifyingly bad. 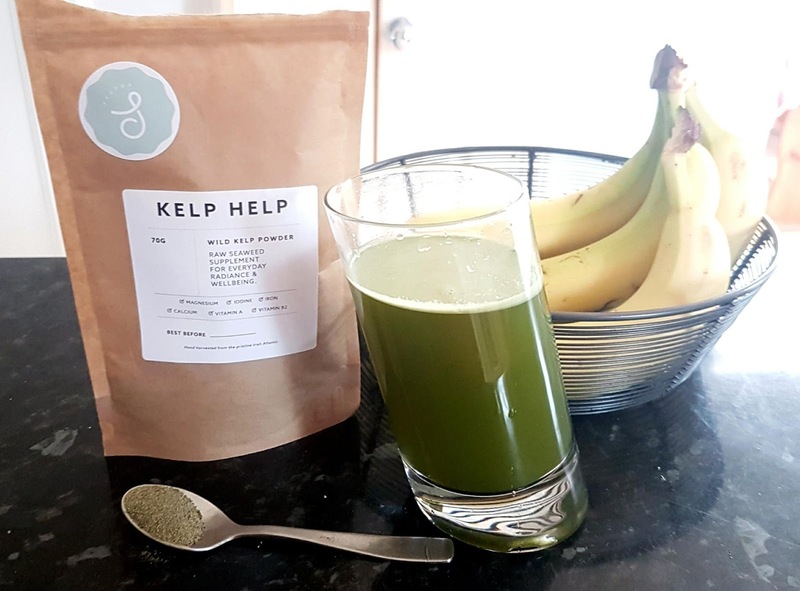 It seems that I have been cursed to only try the worst of the worst when it comes to taste, so I was expecting another vile concoction when it came to this "Kelp Help" wild kelp powder. I can thankfully say that was not the case! On first opening the packet I was surprised right away, as the powder smelled relatively pleasant. It has an earthiness to it, sure, but also a faint sweetly salty scent that makes it much more palatable. I was so happy that this kelp supplement didn't seem to be awful, especially since the benefits sounded so brilliant. Seatox states "This incredible super food supplement is bursting with essential vitamins and minerals like Iron, Iodine, magnesium, calcium and zinc. 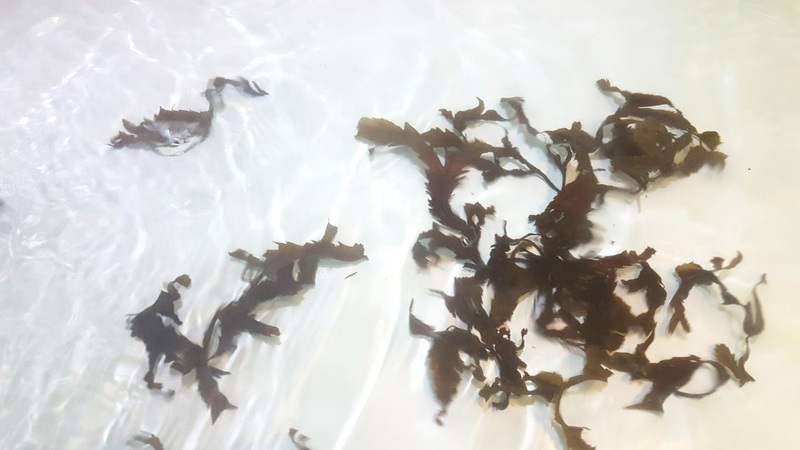 Seaweed is also an natural source of Iodine, (essential for healthy thyroid function and great for your metabolism)!" After looking into kelp powder even more, I was further impressed by all the fantastic health perks it seemed to offer. From lowering LDL cholesterol and blood sugar to decreasing the chances of breast cancer, this stuff seems to really pack a punch! My next task was figuring out exactly how to use it, as the only direction on the packet is to not consume more than 5 grams per week. I am terrible with measurements without using a scale/measuring spoon, so had no idea how much that actually meant I should use (or how to use it!). A quick scan of the product listing on Seatox's website let me know that the absolute maximum amount in seven days is one teaspoon, so going off of that I decided to go for 1/8 of a teaspoon per use. Luckily, Laila also sent me over some tips and let me know that this supplement is actually a multi-use product. It can be used in edibles like soups and smoothies, but also for DIY beauty such as face masks and hair masks! I went for a juice first, as I was keen to see what the taste was like -- to be completely honest, I couldn't really taste it over the banana and it did not change the consistency of my drink at all. This will definitely be making its way into my weekly drinks routine, and probably into several dinner recipes as well since it will make a great vegan umami seasoning. I love a good facial spritzer, and anything with rose in is an instant plus for me, so Earth Harbor was already starting out with great odds. They really won me over with the gemstone infusion though, especially since ruby is my birthstone! Crystal healing has always been around, and has been hailed by many spiritualists and practitioners to be a method for which any complaint can be addressed. The belief is that due to crystals repeating structures, the stone is able to 'resonate' at the same pitch as humans and retain a sort of memory. In other words, they can absorb specific powers or energies that are put into them. So quartz can be programmed with love through the intention to fill it with love. The same goes for gemstones. 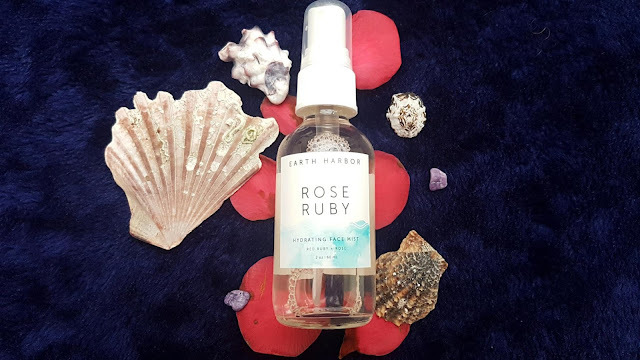 According to Earth Harbor Naturals, ruby is "Considered to be the gemstone of passion with its intoxicating red color and sense of nobility, Ruby is one of the rarest gems on earth. Ruby Extract is delicate on skin, even though Ruby is second in hardness only to Diamond. The incredible molecular structure is what gives our conflict-free Ruby its skin-refining and complexion-brightening powers." These powers have been infused into the facial mist, and work in tandem with the rose, hibiscus, white tea, and seaweed to provide a holistic healing and beauty treatment. The floral water smells lucious, like a rose bouquet, and is possibly the most refreshing one I have tried yet. It instantly lifts my spirit, and makes me feel vibrant and revitalized. While this is a product that has many different uses, from mixing up face masks to setting your makeup, I tend to use it either as a toner, as a pick me up, or as an attention aid. Even though this is priced above the other hydrosols I have previously used, I think it is well worth the extra cost and I will be looking into buying another bottle while I visit my family in NY over the summer. I have mentioned The Salt Parlour before on The ecoLogical, in Exfoliating Favourites, Skin Deep, and an empties post, so my love for the brand has definitely been shown -- and I am so happy to have another pot of this fab salt scrub, as it is a staple for me at this point. The Salt Parlour is totally vegan-friendly like all the other products I have talked about so far in the Vitamin Sea box, and uses only simple ingredients to promote healthy, glowing skin. By blending dead sea salts which are high in minerals (over 20!) 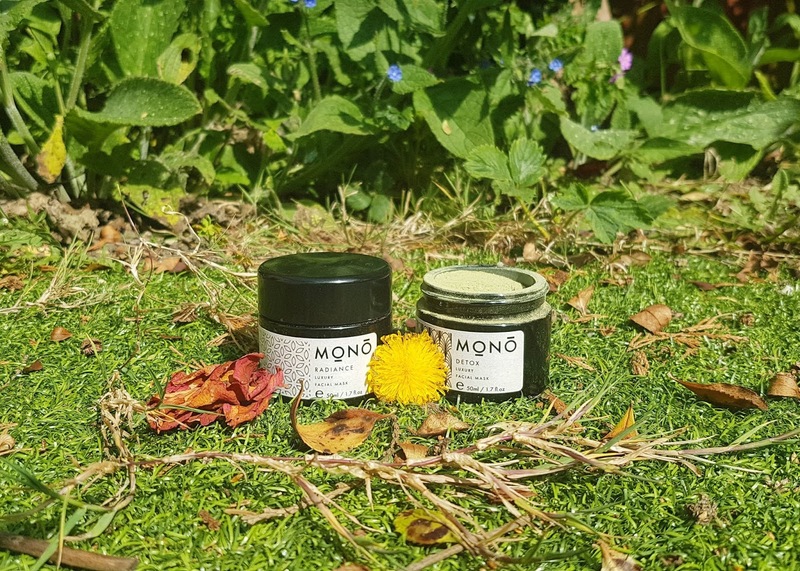 with organic sulphur, an anti-inflammatory that has skin-repairing qualities, this all natural brand is able to create amazing scrubs that target a number of conditions including dry skin, cellulite, poor circulation, and sorting out congested skin. Plus, since these salts are infused with essential oils, they also act as an in-shower aromatherapy treatment! Hydrate was designed to balance, cleanse, and provide an intense moisture boost, and it delivers on all counts. The smell is unique -- not quite cucumber, not quite kelp, but I find this scent refreshing in its own way. The scrub is really gentle, and leaves my skin feeling so soft and smooth. This is one that will be finding more and more use as the weather warms! Ingredients: Kelp, Sea Buckthorn Oil, Cucumber Oil, Dead Sea Salts, Organic Sulphur. I have never used a sea sponge before, and I know their use is a little controversial in the vegan world, but since the tool was included in the collection I did not want it to go to waste. But before I even opened the packaging, I wanted to do a little reading up as I was not entirely sure about the ethics behind using sea sponges since they are indeed considered a marine animal. I found some really informative material on the Hydrea London website about sea sponges, and I was relieved by what I found. While the creature is classed as an animal, it actually has more in common with a plant as it does not have a brain or central nervous system. Additionally, scientists have shown that regular harvesting actually improves the overall health of the population, as sponges release cells and reproduce when disturbed. 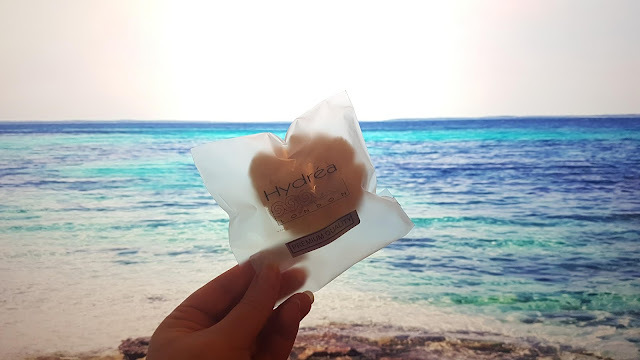 Hydrea London ensures that their sea sponges are sustainability harvested, and they keep a close eye on the environmental impact the removal has on the surrounding sea. My mind set at ease, I was ready to open up the packet and test out the Fina Silk Sea Sponge. I have to say I was impressed by how delicate this one from Hydrea London was - it is seriously soft! The sponge is meant to be perfect for a multitude of things, as it " is super absorbent, hypoallergenic and excellent for use as part of your daily face care routine. The shape and texture (small pores) of this natural sponge make it ideal for applying foundation and make up, deep cleansing in those hard to reach areas around the eyes and nose and gentle exfoliation." The information on Hydrea's website states this sponge is suitable to use for two years with proper care, so this is a great option for anyone looking to switch over from single use makeup wipes or sponges that contain plastic fibers. Vertue Box is £37.00 per box, or you can pre-pay for a plan which scores you a multi-buy discount. Considering this subscription is bi-monthly (meaning you can save for two months to purchase a box instead of having to shell out the money every four weeks - think of it as £18.50 per month if that helps! ), contains high quality products from both well-known and artisan brands, and introduces incredibly unique items like the seaweed bath soak, this is a box not to be missed. And that doesn't even cover the general savings. The Vitamin Sea edition has a value over £55 and includes one item you cannot buy in the UK -- think of the time and customs charges you skipped over! This was definitely the most unique collection I have ever received, and I love every brand and item which is not always the case for subscription boxes. There are so many flower focused products out there it's great to try something different. I love using sea inspired products. I've never tried a sea sponge but it sounds like something I should try! That Pacifica palette is absolutely beautiful! They're one of my favourite brands, they're incredible! This does sound rather tempting as a subscription box! I love the eye shadow palette, just the perfect shades for me! 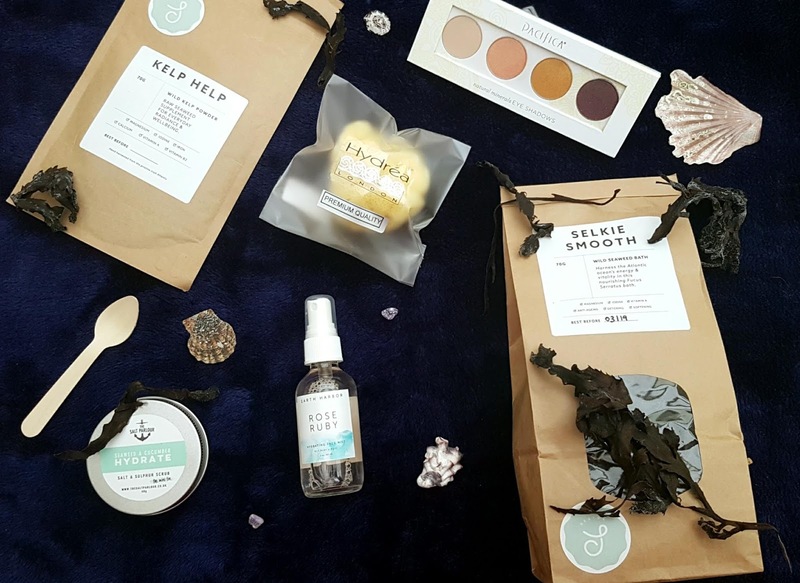 Well considering the fact that I am not only a part time mermaid and unicorn at weekends but also a cruelty free blogger, I love the sound of 'the Vertue Box'. Especially the Pacifica eyeshadow. I'm not so sure how I would find the seaweed, I must admit the thought of it now is making me feel a little uneasy, but I am glad you managed to have a good experience and embrace your inner mermaid! I’ll love to try this subscription box for sure it’s packed with so much goodies!